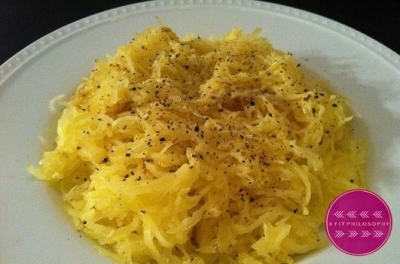 Take whole spaghetti squash and cut directly down the middle lengthwise. Scoop out the loose fibers and seeds. Place on a baking sheet with inside of squash facing up. Shake a little pepper on them. Pop in oven for 45 minutes to 1 hour or until squash can be easily scraped out with a fork. Take fork and remove squash into spaghetti-like strands.